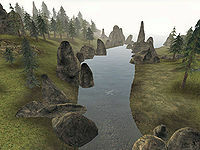 The Iggnir River is a river in southern Solstheim in the Hirstaang Forest region. It runs south from the frozen Lake Fjalding until its mouth empties into the Inner Sea in the South, just east of Fort Frostmoth. Iggnir River forms the eastern border of the Hirstaang Forest region and divides it from the Isinfier Plains. Kolfinna's Dwelling is right off its west bank, northeast of Fort Frostmoth. Frosselmane Barrow is located between the mouth of the Iggnir River and the inlet to its west. The pirate cave Himmelhost Barrow with the unique saber Seasplitter is at the southeastern tip of Solstheim, just to the east of the river. This page was last modified on 10 July 2013, at 14:53.